Involves the removal of leaves, sticks, litter, etc. from the lawn areas, as required, during October and November. This service is usually performed in conjunction with mowing (provided the client is contracted for our mowing service). A light clean up of bed and shrub areas occurs in November, usually after the majority of the leaves have fallen. If the leaves are excessive, two bed clean-ups may take place. Fall clean-up schedule is as follows: October ever 10-14 days as needed (lawn/bed areas). Final clean ups (our last visit) begins in November. Maximum of twice (lawn and/or bed areas). This schedule coincides with mowing requirements, allows for most leaves to fall, allows us adequate time to service all clients, keeps the sites looking as good as possible under the fall conditions as they are and enables us to clean up the majority of leaves before the snow arrives. Note: we realize some sites end up buried under leaves when we come ever 10-14 days. However, most of these same sites would look no better whether we came once every 7 days or once every 3 days. The big difference is in cost savings by hiring us to clean up the same total amount of leaves only in a fewer occurrences. We also offer insect control and plant fertilization for all types of plants, shrubs, and ornamental trees. Evergreen's lawn care program consist of balanced fertilization at the right time for the season. Our seasonal program runs from early spring to late fall. Spring applications include the best crabgrass pre-emergent available and our special blend of spring fertilizer. Applications throughout the season are adjusted depending on the needs of our customers turf. During our late fall applications all lawns are blanket sprayed for all broadleaf weeds. Proper irrigation is essential to the health of your turf and plants. To ensure your system is up and running the way it should be, we provide irrigation services as well. Our services include complete installations, system repairs, and start-up and shut-down. Proper mowing is important not only in generating a more attractive appearance, but also in encouraging strong growth and proper turf development as well. With that in mind, our crews utilize several types and sizes of riding and push mowers, using what ever it takes to create a clean, professional appearance. Additionally, all excess grass is blown off walks, drives, and patios. Walks, drives, and curbs are also edged by-weekly to create a crisp, clean edge. Our mowing schedule consist of April through October as required. May through September mowing is performed weekly as needed. October mowing is performed every 9 - 12 days as needed (this is adequate as growth slows down). We offer a wide range of lawn and landscape services to assist you in creating an attractive focal point for your business. Our services include: Spring / Fall Clean-ups, Mowing, Tree / Shrub Care, Fertilization, Planting Bed Maintenance, Bark, and Irrigation Services. Any of these services can be combined into one contract or quoted individually. Each property we manage receives customized services based on the specific needs of the customer. We will be pleased to provide a quote for our services. Spring clean up is one of the first services of the season to be performed, taking place the later part of March to the first part of May. Clean up is performed one time with a second touch up, if required, at the time of the first mowing (providing the client is contracted for mowing). 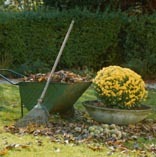 Lawn areas and planting beds will be cleaned of leaves and other winter debris in the spring. All debris and leaves will be hauled away. The lawn is also vacuumed where ever needed if possible. Bark Mulch is usually applied at at 2-3" depth. For optimum benefits and appearance, usually in the spring or early summer, a light layer of mulch is added to existing bark beds. This new layer maintains a 2-3" depth by replacing that which has decomposed and disappeared during clean up of leaves, pruning's, etc. This fresh layer of bark also spruces up the planting beds for another season. The mulch is also effective in retaining the moisture content in the beds and helps to slow the weed growing process as well. It is important to remember that pruning plants is a process, not an event. There is no one day of the year that all plants need to be pruned. Each species has very specific pruning needs based on flower production and the growing season. There will always be plants that require pruning in the landscapes. The reason for pruning ornamental shrubs, bushes, hedges, ground covers and trees include: (1) removing diseased, injured or dead wood, (2) controlling structure, (3) guiding growth aiding rejuvenation, (4) improving appearance and general shape, (5) allowing light, air and moisture to reach the plants and turf growing beneath large plants, (6) removing branches that interfere visibly or physically with foot or vehicle traffic. 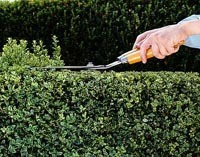 We prune shrubs, bushes, hedges and ground covers twice per year, as required. While some plantings may not require any pruning, others will require both. Though two pruning's are adequate for most plantings, some sites with excessive, fast growing hedges may be bid for two pruning plus a third pruning for the hedges only. In pruning twice per year it is difficult to prune every plant at the most ideal time. Extreme care is taken, however, to minimize noticeable flower and bud loss during the pruning of flowering shrubs. Only trees under 20 feet in height are trimmed (except for low, interfering limbs on taller trees.) Trees are trimmed twice per year. Usually, a late winter/early spring overall pruning is performed, following in the summer/fall with a pruning to remove suckers and water sprouts. Since just a few weeks have the potential to diminish the attractiveness of even the most beautiful landscape, we strongly encourage planting bed maintenance services for all of our customers. We typically include visits every other week to most Landscape Management contracts in order to effectively maintain the neat and clean appearance of the landscapes at each of our properties.